Allows to Preview the EML emails in multiple styles & Import all attachments. Maintains Internal Formatting & Attributes While Export EML to PST Free. Does not requires the installation of MS Outlook to convert eml into pst. Maintains the default folder hierarchy While Upload EML to Outlook PST. The EML to Outlook Converter Software provides the functionality to selectively export eml to pst in batch with maintained folder hierarchy. The software easily converts eml files with ease to pst with attachments embed in the same file. The EML to Outlook Converter Tool allows viewing the content of eml file in different multiple modes such as Normal, Hex View, Property, Mime, HTML etc. The software automatically loads the EML file and its complete emails get listed with item count in the left pane. The EML to PST Free tool enriched with an option to split pst file by its size into multiple smaller parts. This option will be helpful in case if you want to multiple pst files. The software also provides the facility to sort the eml emails by attributes such as To, From, Subject, Sent Date, Received Date etc. 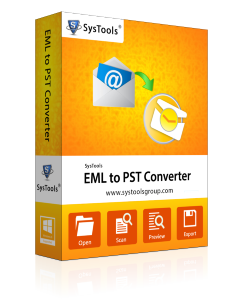 EML to PST Batch converter software provides the facility to the instant preview of eml emails with attachments. The software allows saving the attachments on the local drive. You can also switch the screen view modes i.e. horizontal or vertical. By default screen view modes is set to horizontal. The Free EML to PST Conversion utility supports the eml file created by multiple email platforms such as Windows Live Mail, Outlook Express, Eudora, Windows Mail etc. It automatically browses the eml file from the local storage and converts it Outlook pst file format. The Convert EML to Outlook Tool creates the Unicode PST file after conversion. This will helps the user to store a large number of emails as Unicode PST files belongs to Outlook 2007, 2010, 2013, 2016. After the conversion, you can save the PST file at the desired location as well. Demo version of EML to Outlook PST tool allows Converting and saving first 25 Items from each folder. Does the software require the Outlook Application to convert eml files to pst? No, The Tool is so proficient and smart to convert eml files to pst without installation of Outlook application. Can easily import .eml to Outlook with attachments up to 5 GB of data? Yes, You can easily import eml files to Outlook with attachments. The software does not impose any restrictions on the size of the eml file to be converted to pst file format. Will I use the software on my Windows 10 system also? Yes for sure you can download and installs the free eml to pst converter software to Windows 10 platform also. What will be the format of the resultant file created by the EML Emails to Outlook Converter tool? The software creates the Unicode pst file in the destination. Is there any facility to selectively export .eml to Outlook PST file format? Yes, With the help of EML File to PST Converter software, you can selectively export .eml to Outlook PST file format. What a wonderful experience with the EML to Outlook Converter Software. I amazed to see the performance of the tool. How easily it convert my eml files to Outlook PST with attachments!!. I cannot imagine it right now. But want to say the nice and superb tool to import eml to outlook. Thanks for such nice software. I was looking for the solution that can easily convert eml to pst. I searched for the tool at Google for continuous 5 days. But after such a long time some one has recommended me to use the EML to Outlook Converter Software. I used that tool and successfully convert eml emails to pst. Thanks for the genuine help.